This is a magnificent dive, named after the dive master who discovered it more than a decade ago, Clifton Hamilton, nick-named Mr. Pocket or Mr. P for short, is one of the oldest dive masters in the area. While descending at the mooring, focus on a spot in the reef just north of the mooring line. There is a cluster of bright azure vase sponges. To the left an orange elephant ear sponge, and behind it is a large red sea fan. 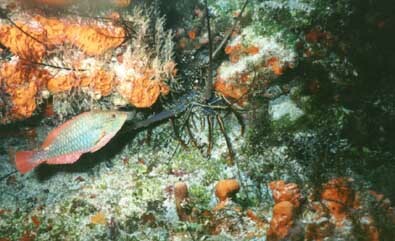 The wall is virtually covered with elephantear sponges and deep water gorgonians. Large schools of fish go back and forth as ceros and barjacks pass overhead. Grunts mingle with blackbar soldier fish , and damsels will fiercely defend their territory as you pass by.